Introducing the CÁPEA™ (Classic Architectural Pool Enclosure Accents) from Century Architectural Concepts. Unlike a traditional pool enclosure, a CÁPEA™ is a graceful structure that is every inch as beautiful as the house and yard that surround it. In the past, homeowners had two choices for pool enclosures. Settle for an aluminum pool enclosure that does not complement the home's architecture, texture, and color, or invest in costly concrete block construction that takes several weeks, or even months, to complete. CÁPEA™ is different. 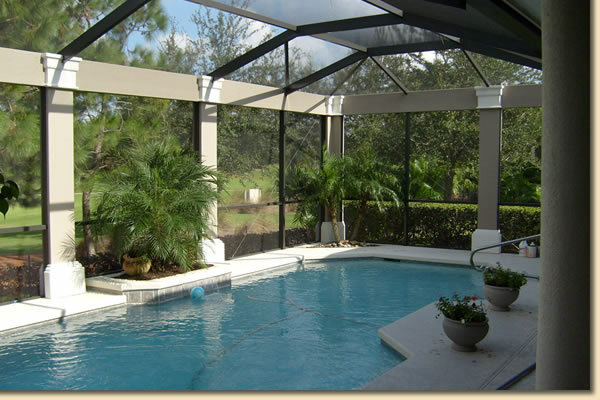 This innovative pool enclosure system lets you match your enclosure to the color and style of your home quickly, easily and beautifully. Composed of high-grade architectural composite material, each CÁPEA™ is custom designed, built and installed with minimum mess and disruption. Whether you need a new pool enclosure or would like to enhance an existing one, a CÁPEA™ transformation can be completed in just a few days. 1. I already have a pool enclosure. Can I still put a CÁPEA™ on it? Yes. A CÁPEA™ can be installed on an existing enclosure or on a new one in as little as one day. 2. Will I be able to re-screen my enclosure without removing the CÁPEA™? Yes. The CÁPEA™is installed without covering the spline grooves on the enclosure, so that re-screening can be done at any time without having to remove any of CÁPEA™. 3. Are my design options limited to what is displayed on the “Style Showcase” page of the CÁPEA™ website? No. Your imagination is virtually the only limitation in selecting your design options for your CÁPEA™. Every CÁPEA™ can be uniquely designed, so every home will have its own unique look. 4. Will the installation be messy, and damage my back yard and pool deck? No, not at all. A CÁPEA™ installation, unlike conventional block and concrete, requires no footers on the columns, and thus no digging. Your yard and your pool deck will remain completely unscathed in the installation process. 5. Does a CÁPEA™ structurally compromise or weaken my screened enclosure? If installed to our engineered specifications, a CÁPEA™ will not weaken your enclosure at all. The CÁPEA™ is adhered onto the enclosure using a high performance 300 MPH wind rated adhesive, and the extra aluminum framing required for a CÁPEA™ installation actually adds significant strength to an enclosure. 6. How durable is the CÁPEA™? The CÁPEA™ is comprised of a specially formulated architectural composite material that is specifically designed to withstand the outside elements to which your enclosure is typically subjected. It is formulated to be highly resistant to cracking, chipping, mold, mildew, and fungus. It is also impact resistant to flying objects such as hail, golf balls, and weed eaters. 7. In the unlikely event that a CÁPEA™ does sustain damage, can it be repaired? Yes. Your authorized CÁPEA™ dealer is well equipped and trained to repair or replace if necessary any part of the CÁPEA™ quickly and easily. 8. Is a CÁPEA™ only for pool enclosures? No! 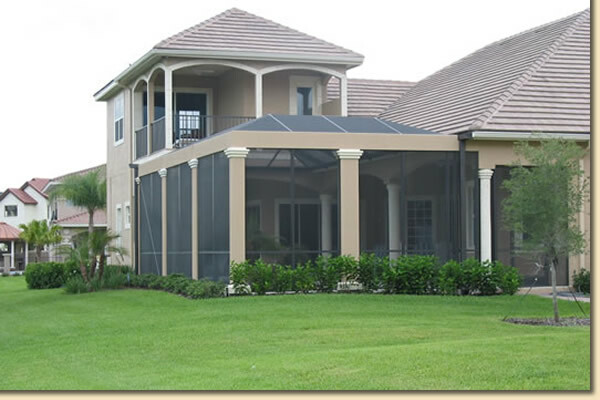 A CÁPEA™ can dramatically enhance a screen room, glass room, or any type of addition.